The 1967 Israeli occupation of Palestinian territories produced a boomerang effect on Palestinian citizens within the 1948 borders, re-framing them as citizen-enemies. While the Israeli legal regime of the West Bank and the Gaza Strip is extensively researched, this study extends its focus to the interrelations between the different parts comprising the Israeli imperial formation. Looking into the use of military courts by Israel, the talk portrays a continuity of this colonial governance mechanism since 1948 until present days, the establishment of a new military court inside Israel following the 1967 territorial expansion, but also changes in citizenship discourses which ended the life of this court. Smadar Ben-Natan is a Visiting Scholar at the Center for Middle Eastern Studies. She is an Israeli human rights lawyer and a Ph.D. candidate at Tel-Aviv University Law Faculty. Her research interests are the social study of law and legal institutions, specifically the intersection of criminal justice, national security, and human rights. 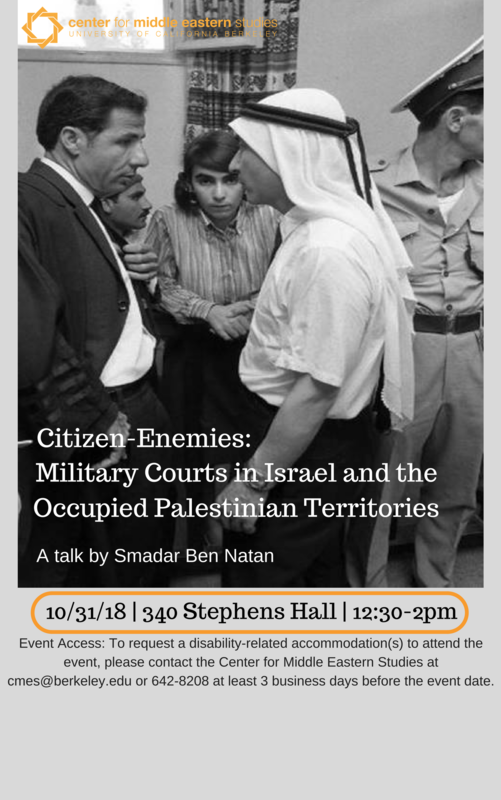 Her Ph.D. project titled Citizen-Enemies explores military courts inside Israel and in the Occupied Palestinian territories between 1967-2000 as an articulation of enemy penology, combining postcolonial and social theory. Smadar holds a Master in International Human Rights Law, with distinction, from the University of Oxford, 2011, and an LLB from Tel-Aviv University, 1995. She is also a visiting scholar at the Center for the Study of Law and Society, UC Berkeley.